There are a few Add-ons from developers out of Asamm Software that greatly cooperate with the core application. Some of them are referred to in the Import of Geocaches chapter as they deal with easy downloading of geocaches. This article is dedicated to those making the geocaching experience with Locus Map even better. Asamm Software is not responsible for functioning, updates nor any damage caused by these add-ons. Their list is informative only and incomplete and may vary. 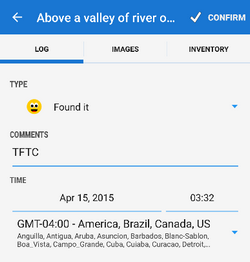 Many geocachers welcome the possibility to log their findings directly in terrain. Field Notes provide solution for cases when there is no internet connection to log online. It offers simple and intuitive interface for work with existing field notes (logs), creating new ones, for mass logging via Locus Map etc. select type of log (Found it, Didn't find it…), insert comment, attach images etc. For even quicker logging pre-fill the logging dialog in Settings > Geocaching. select from the topbar menu: export, sorting options, multi-select options, make settings. Field Notes add-on offers even more functions, e.g. more log templates, voice logging etc. 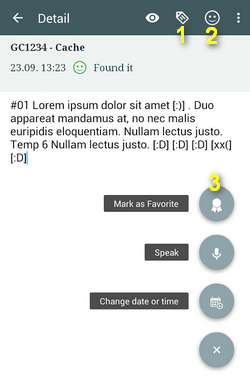 The functions are available after purchasing Field Notes unlocker in Locus Store. A useful tool for paperless geocaching helps calculate variables and formulas in multi- and mystery caches. Simply open the cache in the addon, mark the formulas in the description and the solver will find the used variables and will calculate your next waypoints. It automatically submits the new coordinates to Locus so you do not need to enter them by hand yourself. when you go geocaching without caches imported in your device and you want to log this cache via Field Notes etc. This addon enables downloading static Google satellite map images for geocaches. It allows to select image resolution, format and zoom levels for downloaded maps. Maps are stored in “Images” tab of a geocache detail screen.